She chose the table with a black tree that had a flaming sunset behind it, reds and oranges bursting from behind the branches and oozing over the sides. 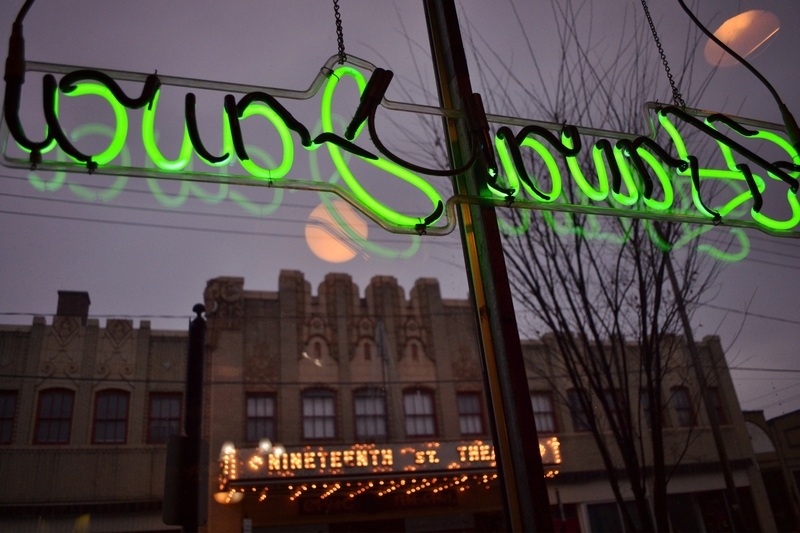 I was happy she chose a window seat so I could watch the rain fall over the theater lights as they glowed in the dusk. I stumbled upon Hava Java as I was in search of a meeting spot for my friend and I. We always enjoyed avoiding chains and finding unique cafes to hold warm mugs of Joe and laugh at all the stories we gathered since our last meet up. 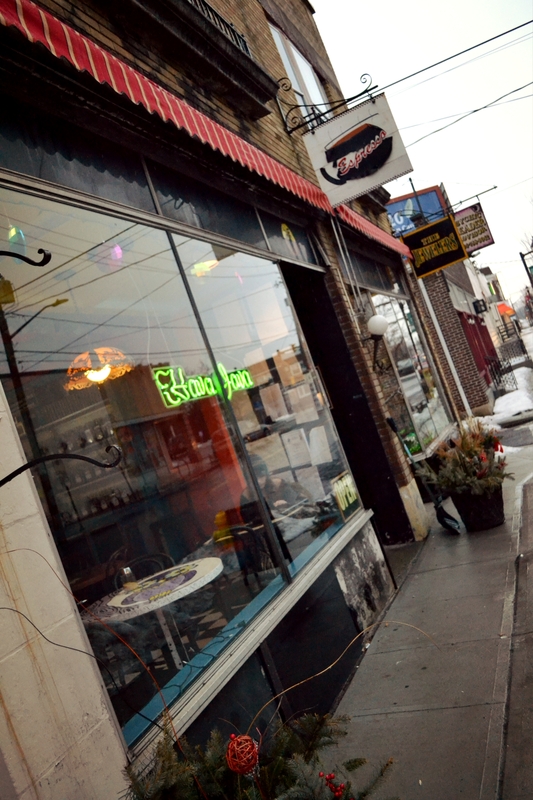 Yet, in our search for ‘our spot’ in the Lehigh Valley (mainly Bethlehem, Easton, and Allentown), we became frustrated as most small business coffee shops did not cater to the working crowd, closing at 5:00 or 6:00 pm. We needed a location that was open until at least 9:00 pm to allow enough time to get home from work, refresh, and head out and enjoy an hour or two of conversation before calling it a night. This is when we found Hava Java. The cafe is nestled in a line of shops on N. 19th Street in Allentown right across from the Civic Theater which has a huge marquee that adds an exquisite glow to the storefront. It is also about a block down from the Allentown Fairgrounds. 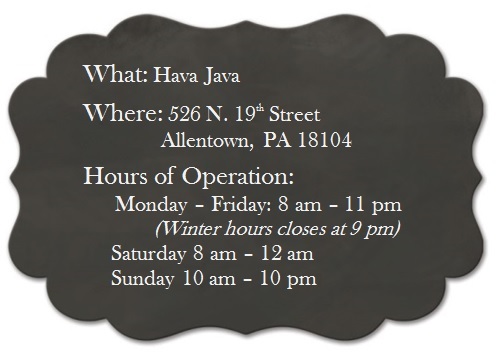 When I first walked into Hava Java, I fell in love with it. I saw exposed ceiling beams with an array of mugs hanging by hooks. Each mug is different – color, logos, size, design, it’s as if someone went to every yard sale on the east coast to gather such a quirky collection of mugs. Upon inquiry, I found that they were each from different customers throughout the years, which made me appreciate them even more. Once your enchantment ends, or your neck gets sore from looking up at all the mugs, looking down and around all you see is color and art. Each table in the cafe is decorated differently, from the aforementioned flaming sunset, to whimsical owls. There is also local art on sale on the walls and nestled in on bookshelves next to bubble gum machines filled with chocolate covered espresso beans or raisins. The owner of Hava Java really appreciates local artists. Not only does she promote their pieces in the shop, but she also hosts open mic nights for musicians and artists. She also seems to appreciate giving patrons a home away from home. She is always there cozy on the couch with her laptop. I read some reviews of the cafe and what bothered me is that they dubbed this as a bad thing. I tend to disagree. I think seeing the owner of a small shop enjoying their own establishment and being comfortable is promoting the atmosphere of “get a coffee, grab a seat, be as comfortable as you would be at home.” This is a coffee house you are never rushed out of, it’s a place you can bring work to do without feeling uncomfortable when your coffee cup is empty. The pricing is similar to the “S” word (“Starbucks”), with specialty drinks running $4.00-$5.00. I tend to always opt for a to-go cup as they seem to be bigger than an in-house mug – more drink for your buck. More times than not, I get the chocolate chai which is delicious both hot and iced. I have also indulged in some sort of spinach quiche and it was sensational! They also have an array of baked goods on the counter. Since they are a small shop, they do have a minimum amount for running credit cards, so I suggest grabbing a cookie. 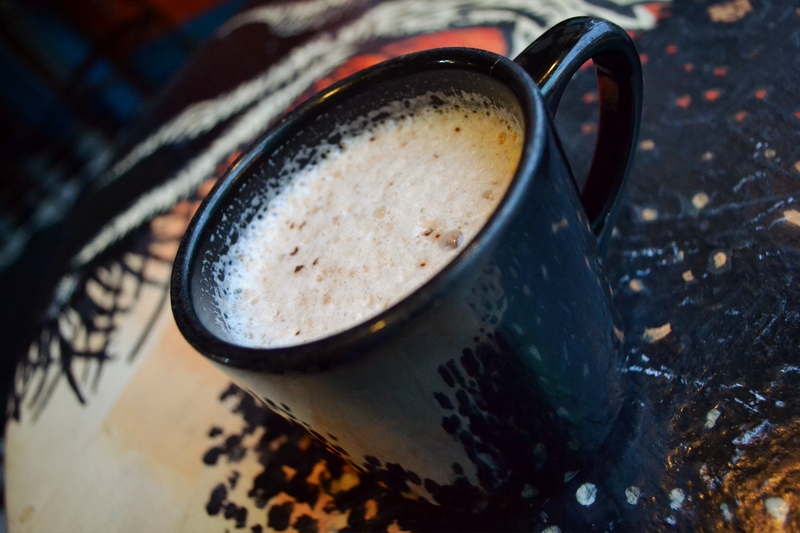 If you are looking for a unique coffee shop, a small business who appreciates local art, a good chocolate chai, and a place that is open long enough to catch up with a friend after work, this place fits the bill!